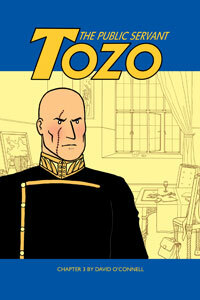 Kleefeld on Comics: Tozo, Chapter 3 On Sale Now! David O'Connell has just gotten chapter 3 of his wonderful webcomic, Tozo, The Public Servant, printed up and he's selling them here. I just ordered 3 copies of the issue (since I'm in it!) and another full set of the first three issues since... well... it's really good. Thanks Sean - comics were mailed on Tuesday so hopefully should reach you soon!